"Join us for our local handmade gift and art show on Saturday, October 3rd from 9AM-3PM. Located on Bethel Road in Old Town Coppell"
Booths are 10 X 10 and cost $25.00. Applications are available here and are due by September 10, 2015. 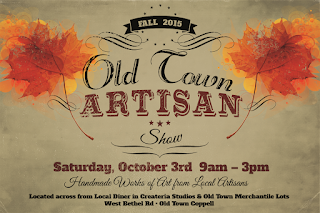 For more information, contact their event coordinator at info@oldtownmercantile.com / 469-955-2038.